This is the twenty-first installment of the monthly classic actress beauty tips that I have read about and tested. First, I would like to apologize for not posting a beauty tip in February-it’s the only month I’ve missed a beauty tip and I don’t plan on making it a habit. March’s beauty tip is going to focus on fashion I have copied from films. For the time being I’ve run out of regiments to test, but I’m still digging around for some. However, fashion, hairstyles and jewelry are just as important to a film star’s beauty as how she washes her hair or face. As many of you know, “West Side Story” (1961) is one one of my all-time favorite films. The music, the colors, the sadness, all make the movie perfect, but another thing that has drawn me to the movie are the beautiful outfits. Who can forget the purple dress Anita wears to the dance and the white dress Maria feels makes her look like a baby? But my favorite three are the yellow dress Maria wears while singing “I Feel Pretty,” the blue dress Maria wears as she waits for Tony after the rumble and the orange dress we get a brief glimpse of Anita wearing in the dress shop when she catches Maria and Tony together. 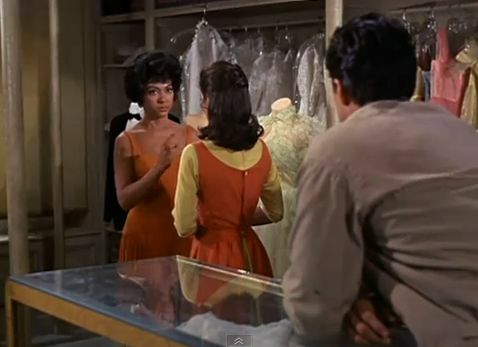 Anita warning Maria she must be home in 15 minutes-both wearing two of my favorite outfits in "West Side Story." I buy several vintage clothing items on Ebay that reminds me of classic films: peasant blouses, fiesta skirts, silky formals, pinafore dresses, flashy earrings. 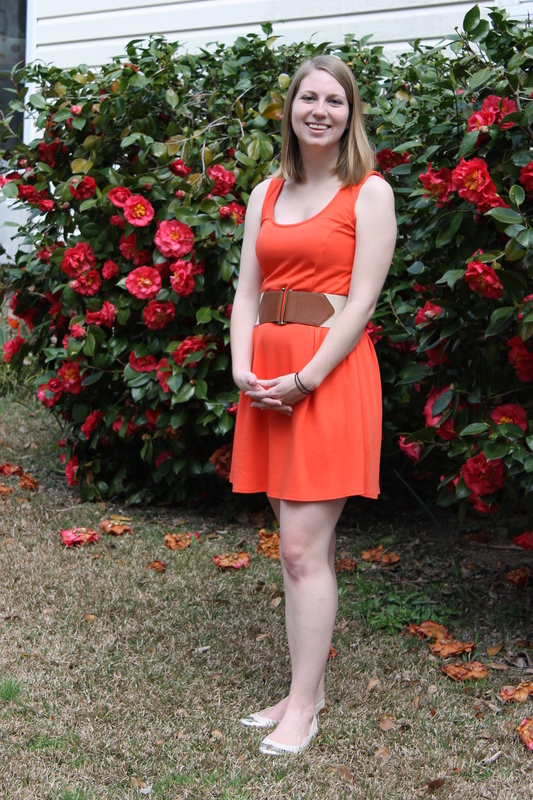 Then one day I was in TJMaxx and sticking out of the rack I saw a sleeveless orange dress. I immediately thought of Anita in “West Side Story” and bought it. Bought this dress at TJMaxx because it reminded me of my favorite movie. To review: Fashion is important to me, but particularly if it reminds me of something I’ve seen in a movie. The best places to find movie like clothing is on ebay or stores like vintagevixen.com, but sometimes you can get lucky! UNRELATED REMINDER! Comet’s Gone Too Soon blogathon is on the 9 and 10th. Follow this link for more details and a list of who bloggers are covering- https://cometoverhollywood.com/2012/02/03/upcoming-comet-blogathon-gone-too-soon/ Further updates will come this week. This entry was posted in Beauty Tips and tagged beauty tips, fashion, Natalie Wood, Rita Moreno, West Side Story by Jnpickens. Bookmark the permalink.